Unfortunately we can no longer recommend Borgata Poker for players in New Jersey. Instead, we suggest using 888 Poker, who offer a 100% deposit match up to $888! April, 2019 – If you never heard of the Borgata, the leading casino and poker room in Atlantic City, NJ, you probably cannot play legally on any of the New Jersey online poker sites, including the Borgata, because virtually every poker player in the state is familiar with this brand. In November, 2013, New Jersey became the third of only three U.S. states thus far to introduce fully legal state-run online poker; the other two states are Nevada and Delaware. Borgata Poker is not the only legal state-run online poker room that opened up in New Jersey on the inaugural day, 11/26/13, and is still running, but along with its sister site, Party Poker, it has consistently led the pack in traffic. So, assuming that you live in or visit New Jersey often and would like to play poker legally online, but have yet to sign up, what are you waiting for? To date, some 250,000 people have signed up with Borgata Poker, so clearly, this is a site with widespread appeal. But that comes as no surprise since the Borgata Casino itself, with which it is affiliated, generates more revenue than any other casino in Atlantic City. In fact, if you enjoy switching up your play to include casino games as well as poker, as a Borgata player you have two convenient options. You can access all of your favorite casino games online at Borgatacasino.com and have the reward points you earn from your casino game play count along with the reward points you accumulate playing poker on poker.theboargata.com. You can also use the points you have earned online towards rooms, meals, and entertainment at the Borgata Casino and, of course, earn more rewards playing poker and casino games there, too. You can even do all your online banking (both deposits and withdrawals) at the Borgata Casino. If you would like to know more about what Borgata Poker has to offer New Jersey poker players, you should find this comprehensive and unbiased Borgata Poker New Jersey legal poker review written expressly for PokerSites.us especially informative and helpful. The days when American online poker players had to settle for a token Welcome Bonus, or no Welcome Bonus at all, are happily over. At least, if you are a new player on poker.theborgata.com, you should be very pleased with the generous offer awaiting you when you first sign up as a real money player. The Borgata Poker Welcome Bonus consists of a 100% match of your first deposit up to $600. However, it is important to note that this offer is for new Borgata online players only. Even if you are new to Borgata Poker, but have already signed up as a player on Borgatacasino.com, you cannot receive the poker bonus. Unfortunately, websites have the prerogative to discontinue or change bonuses at any time, either with or without prior notice, so if you see a particularly good offer, it is a mistake to assume it will last indefinitely. Your best advice is to sign up as soon as possible and also double check to make certain that the offer posted on the website is still available. The way a Welcome Bonus for online poker usually works, and the Borgata Poker Bonus is no exception, is that receiving the bonus is contingent on making an initial deposit into your account. Then you will have to register a specified amount of play before any of the bonus money is actually cleared for withdrawal. It is a known fact that gambling websites open to players in America typically do not offer anywhere near the wide range of banking options that are available to players in many countries outside of the U.S.A. However, Borgata Poker has added a few more deposit methods to those that were available initially, so most players should not have a problem getting funds instantly credited into their account. The various deposit methods include MasterCard and Visa credit and debit cards, Instant Checks (ACH bank transfers), Online Banking Transfer, Neteller, Skrill (Moneybookers), the Borgata Online Prepaid Card, and cash deposited at the Borgata casino cashier. However, some people are still having problems using their credit cards since not all banks accept online gambling transactions. Therefore we recommend using one of the other methods or checking with your bank on its policy beforehand. The Borgata Welcome Bonus is a 100% match of your initial deposit only; additional deposits don’t count. You are then given a total of 45 days to clear the bonus with your play. The bonus is cleared by earning iRewards points (iRPs) each time you play, either by contributing to the rake in cash games or by paying tournament fees. You earn 2 points for every $1 you contribute to the rake in a cash game or spend in poker tournament fees. Then every 4 iRP earned counts towards releasing $1 of the bonus. The bonus is released in increments of 10% of the amount of the first deposit. In other words, if you deposit a total of $100, the bonus gets released to you in 10 increments of $10 each. To clear the additional non-deposit related $20 bonus, you need to earn 40 iRPs. Presumably you are reading this Borgata Poker review for legal online play in New Jersey because you either live in New Jersey or you visit the state frequently enough that signing up on one of its gambling websites makes sense. While you do not have to be a resident of New Jersey to play on BorgataPoker.com, the same regulations apply as for any of the NJ operated gambling sites. You must be 21 years of age or older, and you must be physically present in New Jersey at the time of play. As required by law, the site uses Geo Location software to verify that in fact you are situated in New Jersey at the time you log on. If you are not, although you can still deposit money to your account or make withdrawals, you won’t be able to play for real cash. Furthermore, your computer needs to be equipped with Wi-Fi and the Wi-Fi signal capability must be turned on. Otherwise, even if you are in New Jersey, you might not be able to access any real money games. Borgata Poker is powered by Bwinparty software. Borgata Poker offers the same games, uses the same software, and even draws from the same player pool as the New Jersey version of Party Poker. However, the rewards program and promotions are different. If you wish to play on both sites you can, but you will need to set up separate accounts. The well designed website is user friendly and easy to navigate, so even though there is a lot going on, you won’t have any trouble finding and settling down into your game of choice. The site especially caters to young, affluent, competitive players who enjoy bragging about their “missions” and “accomplishments” and using social media to connect with their “friends.” If you are a traditional player, you might feel like a fish out of water. On the other hand, if you like the charged up atmosphere of the brick and mortar Borgata poker room and casino, you will probably also like playing on Borgata.com. You can download the software, play the instant flash version, or play on your mobile devices! There are three ways to access the games on BorgataPoker.com. The first is to download the software onto your computer. Many players prefer this method because it not only gives you quick access to all of the site’s many cash games and tournaments, but also to various customizable features. The disadvantage, of course, is that you are tied to your home computer. So, if you prefer, you can opt instead for the instant play flash version, which lets you play on any browser and is both PC and MAC compatible. Your third option, and the one giving you the greatest flexibility of all, is to play on your mobile device. The Borgata Poker Mobile platform is compatible with both Apple iOS and Android devices. The app for Apple iOS devices can be downloaded on the app store, and the app for the Android devices can be downloaded directly on the website. See the instructions on the website for specifics. Also, if you are having any difficulty downloading and using the apps, Customer Support is available to help you 24/7 via live chat, phone, or email, just as they are your go-to source for any other player related questions. A major weakness of the Borgata poker apps is that you are limited to ring games. 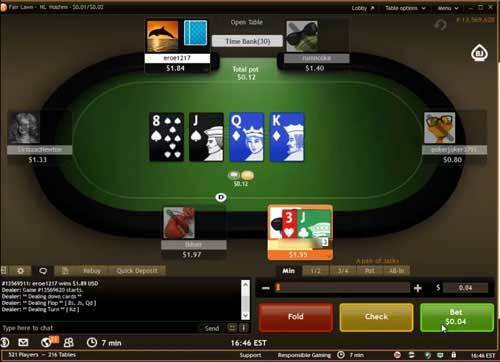 You can also play fast fold poker (see the section on Games for a description), but you won’t be able to play any tournaments, even sit and gos. However, for anyone on the go a lot, having 24/7 access to your favorite poker cash games on your iPhone, iPad, iPod Touch, or smartphone can add hours of enjoyment You can even set up your account and do your online banking on the app. The chart below shows the minimum and recommended system requirements for Borgata Poker computer play. Most online poker rooms are not open to U.S. players at all, and those that are more often than not have a very meager game selection. Our Borgata Poker New Jersey legal poker review shows that this site is different. The hubbub of activity 24/7 assures you that you will never be bored, and the site accommodates all levels of players and bankrolls. While No Limit Hold ‘Em is clearly the most popular game, those wishing to play other varieties of poker won’t be disappointed. Your choice of real cash games includes No Limit and Limit Hold ‘Em, Omaha and Omaha Hi-Lo, 7 Card Stud and 7 Card Stud Hi-Lo along with an interesting alternative to regular poker called Fast Forward Poker. While the range of limits does not compare to what you will find in the Borgata’s land-based poker room, non-limit hold ‘em players can choose stakes ranging from as low as .01/.02 up to $5/$10, while limit games go as high as $25/$50. The Fast Forward games are strictly for low stakes. Their unique characteristic is that if you want to fold your hand, you can do so immediately without waiting for your turn. Also every time you fold your hand and also at the completion of every hand, you change tables so you are playing against a new set of opponents. Obviously, observing and taking notes on other players is impossible in this game, but the fast and furious action enables you to get in a lot of hands in a short amount of time so you can build up your reward points. 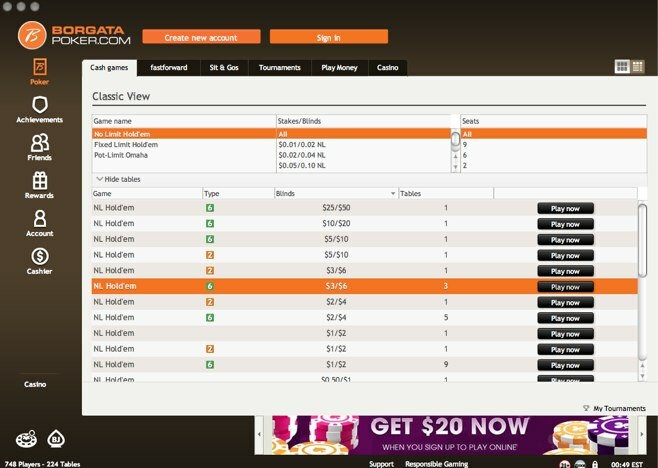 In addition to the many cash games you can play on BorgataPoker.com, if you are looking for a site with lots of tournament action, this is the place. Unfortunately, you won’t have access to any of these tournaments on your smartphone or tablet, but if you are logged onto your computer, you can enter tournaments to your heart’s content. The biggest weekly tournament on the site is the $50K Guaranteed Sunday Tournament taking place every Sunday at 5 p.m. EST. This is a no limit hold ‘em tournament with a buy-in of $200. It is a steep price for a tournament, but with a guaranteed payout of 10K for first place, it is a worthwhile investment for those who can afford it. Another option is the daily $10,000 Guaranteed Freezeout Tournament taking place every evening at 7 p.m. EST. That tournament has a $100 buy-in. If you are looking for a site with lots of tournament action, this is the place. You might also want to take a shot with the Sunday 1K Freerolls. First place pays $200, second place pays $150, and third place pays $100.The payout for 40th-21st place is only $5, then for 10th-11th place $10, and $10 more for each next place finish through 4th place. So clearly, there is not a lot of money to be made from these completely free tournaments, but there are no special qualifications and there is nothing to lose. All you have to do is show up, register, and play! The above only scratches the surface of the many different kinds of tournaments you can play on BogataPoker.com. Some of your other options include freerolls, satellites, sit and gos, and bounty tournaments on the regular schedule along with special events taking place at different times during the year. In fact, Borgata Poker offers a way you might qualify for a tournament for only a fraction of the regular cost through what it calls its “Level Up” feature. The daily level up tournaments work similar to satellites, except that instead of playing for a seat in a specific tournament, you play to try to win a ticket good for any tournament at the corresponding buy-in. Level 1 Satellites, costing .50 (plus .25 for rebuys and add-ons) award a $5 ticket; Level 2 Satellites, costing $ $5 (plus $1.00 for rebuys and add-ons) award a $20 ticket, and Level 3 and 4 Satellites, each costing $20 (plus $5 for rebuys) award a $100 and $200 ticket, respectively. The $100 ticket can be used to enter the $10,000 Guaranteed Daily Tournament, while the $200 ticket can be used to enter the $50,000 Guaranteed Sunday Tournament. If you have ever played in Borgata land-based poker room, you probably already know that this is a place which attracts players of different playing styles and skill levels. The same is true for BorgataPoker.com. 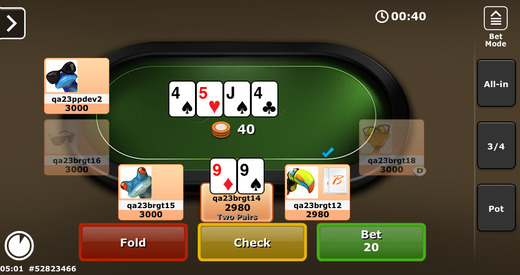 It is not the fishiest site on the Internet by any means, but if you are a beginner or do not feel you can hold your own against highly skilled players, you should not have a problem finding beatable games at the lower stakes tables. As you move up to higher stakes, the competition will become tougher, so even if you can afford to play at these higher levels, we do not recommend it unless you have the skill levels to match. One thing in your favor if you are looking for soft competition games is that many players on the site are primarily casino game players who decide to switch over to poker as a diversion rather as their primary game of choice. Another aspect of our comprehensive Borgata Poker review of this legal online poker room for New Jersey players has included a close look at the noteworthy features that distinguish this site from the competition. 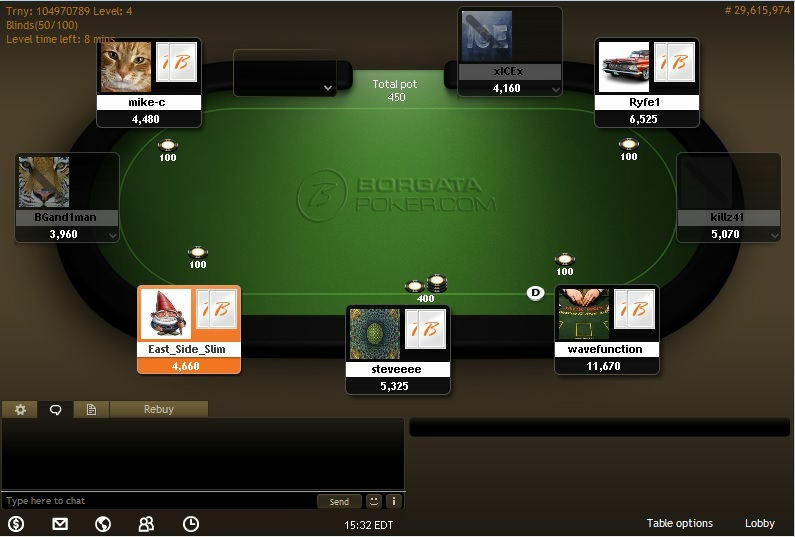 The Borgata Poker software has a new feature called Click Lobby which shows you selected options for cash games, fast forward tables, sit and gos, and tournaments to help you get to your desired table much more quickly. But if you would like to see additional options in a particular category, simply click on the appropriate tab and scroll down to see other ring games or tournaments being offered. Also, thanks to the Borgata iRewards program, every time you play poker, you continue to earn 2 loyalty points (iRPs) for each dollar contributed to the rake in a cash game or paid in tournament fees. You can also receive iRPs on casino games at BorgataCasino.com. Points can be redeemed in the My Borgata iRewards Store for a wide variety of items like clothing and electronics or, if you prefer, cash, bonuses, or rooms, meals, and entertainment at the Borgata Hotel, Casino & Spa. You can also use your iRPs for buy-ins to tournaments and satellites. There are five loyalty tiers, which are referred to as iReward Levels: Red Label, Red Label Plus, Silver Label, Black Label, and Black Label Elite. Status is determined by the total number of iRPs you have earned in the preceding month, or for Black Label Elite, in the preceding quarter. The minimum number of points required for each level are 150 points for Red Label +, 650 points for Silver Label, 2,500 points for Black Label, and 15,000 points per quarter for Black Label Elite. As soon as you reach the required point level for the month or quarter, you are upgraded to that status and retain it for at least the rest of the month or quarter and all of the following one. Each level brings along with it a higher level of rewards and benefits, including faster earning of bonus rewards, bigger discounts, and more attractive special offers. However, it does seem like the Borgata can do better than to offer Black Label Elite players just one free night at the Borgata Hotel, Casino & Spa since Black Card holders at the casino receive free rooms on a regular basis. Of course, you don’t have to be a high roller to take advantage of various special promotions being offered from time to time, along with the opportunity to complete “missions” and “accomplishments” for bragging rights with your friends. Be sure to check the website regularly so you don’t miss out on these frequently changing offers. Lastly, if you are new to poker, you might find the introduction to the basics of Texas hold ‘em and Omaha on the website helpful. However, this information is very general. If you are already a seasoned player, there probably isn’t anything mentioned here that you don’t already know. Only players who are physically situated in New Jersey are allowed to play on the site for real money. Loyalty program could be more generous. Shared player pool with PartyPoker means lots of traffic. Welcome Bonus offer is very generous, and the 45-day time period to clear it is reasonable. Loyalty points can be spent at Borgata Hotel, Casino & Spa in Atlantic City. Pokersites.us Conclusion: As shown in this Borgata Poker New Jersey poker review, legal online poker on this site is very popular with New Jersey players. Like any other online poker room, there is room for improvement, but if a site with competitive players, lots of action, and the opportunity to use your rewards towards stays at the affiliated casino fits the bill, you should give this online poker room a try. Along with its sister site, Party Poker, Borgata Poker is ranked No. 1 by New Jersey online players.